I went to Isaak's preschool conference, while Daddy took the kids to swim lessons. His teachers told me that Isaak is a typical three year old. He knows most of his colors. I say, "Most" because according to Isaak the color silver is always white. I know this because he has silver shoes. They said Isaak can count to 35 and he knows some of the sequence after that, but skips numbers. They were impressed that he can bounce a ball. He loves bouncing basket balls at the Y.
Isaak plays well with others and by himself. His teachers said that the young boys play so well together. The 3 year olds demand less attention then the older 4 year old girls do. He also stands up for his cousin. When they were at their other campus Cousin Elijah got picked on by an older kid. The older kid wanted Elijah's toy and said, "I can be mean!" Elijah said, "I can be mean to!" Isaak stood up and put his hands on his hips, raised his eyebrows and said, "I can be really mean!" Then that kid backed away. Mrs L said that she was role playing, pretending to be a clown. She toppled to the ground (on purpose) and Isaak jumped up on top of her. He loves to wrestle. 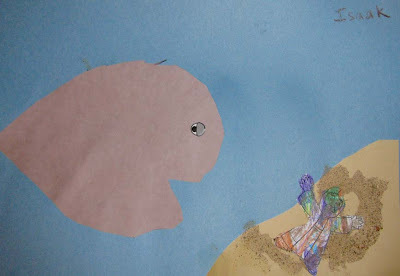 Meet Jonah the hippo who vomited out Jesus. This is what Isaak told Daddy the image was about. I told Isaak's teachers about him being wet when he came home one day. Daddy asked him, "Didn't your teachers take you potty?" Isaak said, "No! They were too busy praying." That still cracks me up. It made his teachers laugh as well. He's really a typical three year old boy. He loves to color, but still scribbles. He knows how his name looks, can't write it yet, but does allow us to steer his hand to form letters. I bet his teacher was surprised when she fell to the ground and Isaak jumped on top of her. How funny that is.